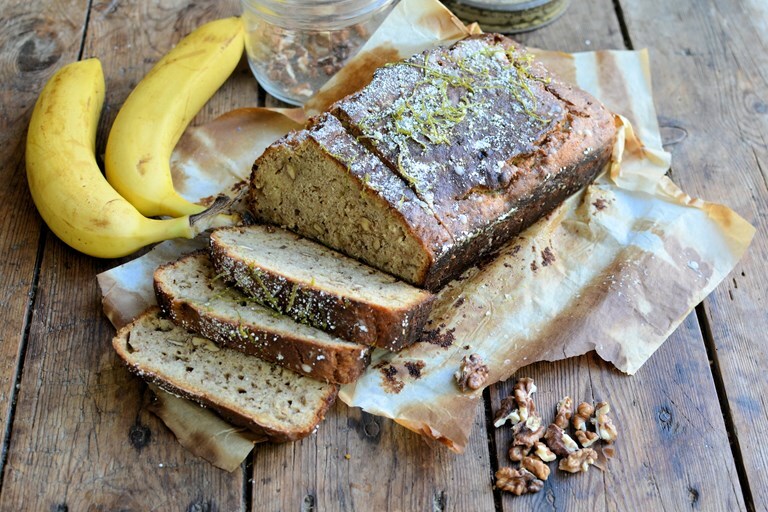 This banana bread recipe from Karen Burns-Booth is a beautiful twist on the classic, adding a little mixed spice for extra-warming flavour and a lime drizzle for added zing. 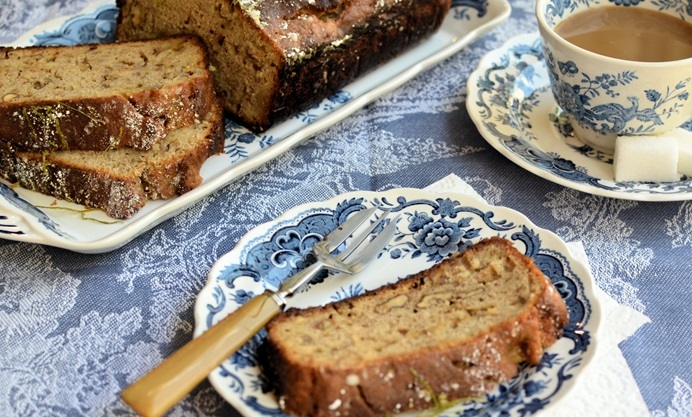 Banana bread, even the name is warm and cosy, for me it conjures up images of school lunch boxes, afternoon treats at my grandparents old scrubbed pine table and family picnics, it’s homely, as well as cheap and cheerful, a proper tasty little number! I make banana bread regularly, using my mum’s adapted recipe from an old Be-Ro cookbook; it’s a fail-safe recipe and one that the whole family loves. Banana bread also falls into that peculiar category of being a quick bread that can be eaten for breakfast, as well as afternoon tea etc. I remember enjoying it with a plate of fried flying fish when I was on holiday in Barbados. Today’s recipe for Banana and walnut bread with a lime drizzle is based on an existing recipe but I’ve notched it up a bit and poured a deliciously tangy lime syrup over the bread once baked, for an extra taste sensation and to make the bread even moister. The banana bread still has walnuts, I think you need them for the texture as well as the taste, and I have also added a teaspoon of mixed spice for a warm spicy aroma and flavour; you can add cinnamon too, if you are not a lover of mixed spice, which also works very well. I hope you enjoy the recipe which is shared below, and don’t forget to use light brown sugar for an extra toffee-like flavour which is perfect with the added bananas and walnuts. Banana bread also freezes well, so you can make a couple of loaves in one go, and freeze one for later delectation!